The women, from outwardly feisty to quietly mutinous, who made the Edwardian era so colorful. One of the world’s premiere automobile brands, Rolls Royce conjures the image of wealth, class and elegance. Founded in 1906 by Henry Royce and Charles Stewart Rolls, the firm soon became entwined with the 2nd Baron Montagu of Beaulieu, Conservative MP and motoring enthusiast, and the Hampshire village of Beaulieu, the location of his ancestral home, Beaulieu Abbey. By the early 1900s, the Rolls Royce quickly outpaced its competitors as the motorcar for the wealthy and sophisticated–no doubt because of its costliness (the average price of a car in chassis form was around £650 and the Silver Ghost cost ₤1,154! )–and the series of motor trials which convinced those who took up the automobile for sporting purposes that the Rolls Royce was reliable, looked good and drove fast. The motorcar was here to stay despite protestations from the rural districts, coachmen and other citizens alarmed by the emergence of the horse-powered vehicle over the horse, but many automobile manufacturers and enthusiasts found it prudent to capture the support of lawmakers, preferably the highest in the land–Parliament. Lord Montagu of Beaulieu was a powerful ally. Friend of the King, and founder and editor of The Car Illustrated magazine, his support, among others, of the 1903 Motor Car Bill raised the speed limit to 20 mph and implemented the registration of all motorcars and motorists. 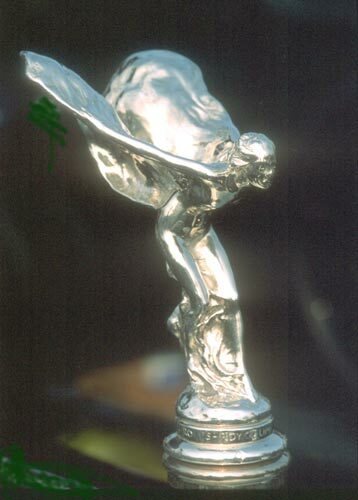 Lord Montagu raised the profile of motoring by introducing King Edward to the sport, appearing at many of the first motor rallies and raised the profile of the Rolls Royce when the mascot he commissioned was presented by its sculptor to the company–the Spirit of Ecstasy. The early motor car featured a radiator cap on its hood/bonnet, but by 1910, the hood ornament/car mascot became fashionable. Responding to customers who felt a firm as prestigious as Rolls Royce should feature its own luxurious mascot, and concerned their customers were affixing inappropriate ornaments to their cars in its absence, Claude Johnson, the managing director of Rolls-Royce, was asked to commission something suitably dignified and graceful. He turned to sculptor Charles Sykes, asking him to produce a mascot which embodied “the spirit of the Rolls-Royce, namely, speed with silence, absence of vibration, the mysterious harnessing of great energy and a beautiful living organism of superb grace…” Years previously, Sykes had been asked to create a mascot for Lord Montagu’s Silver Ghost, and he submitted a modified version of it to Rolls-Royce in February of 1911. What was listed initially listed as an optional extra, only to become a standard fitting in the early 1920’s, was no ordinary car mascot; the silver sculpture of a flying lady had a past. Lord Montagu of Beaulieu had commissioned this mascot as an emblem not of wealth and luxury, but of love. The subject, Eleanor Velasco Thornton, was a young woman hired as his secretary in 1902, and the two fell quickly in love. But the baron was married and Miss Thornton was barred from being his partner not only because of his matrimonial bonds but also by her much lower social status. The two nonetheless were inseparable for the next decade, Eleanor bearing his child and continuing her work with him on The Car Illustrated. 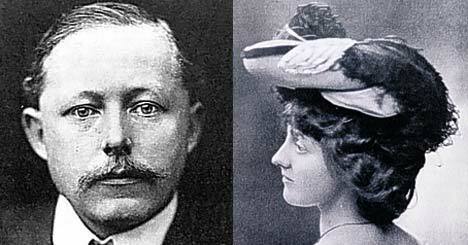 To commemorate their secret love, Eleanor modeled for Montagu’s personal hood ornament, and Sykes crafted a figurine of her in fluttering robes, pressing a finger against her lips – to symbolize the secrets of their love. The figurine was christened The Whisper. Tragedy struck in 1915 when their voyage aboard the SS Persia, on which they were traveling through the Mediterranean on the way to India, was torpedoed by a German U-boat. There was no time to get to a lifeboat and as they made for the decks on the listing ship, “Montagu had Eleanor in his arms, the next they were hit by a wall of water and she was gone.” He survived and made his way home to read his own obituary in the Times. The baron passed away fourteen years later and with him, the secret story behind Rolls-Royce’s iconic emblem. Happily, the tale of the star-crossed lovers lives on today, as it has been announced that Batman Begins actor Christian Bale has been tapped to star in The Silver Ghost, which will tell the story of the thirteen year affair between John Montagu, who later became Lord Montagu of Beaulieu, and Eleanor Thornton, his secretary. Between the years 1870 and 1914, hundreds of American heiresses flooded the shores of Britain and Continental Europe. To this day, their influence (and lineage) can be traced through many noble European households, and even some royal ones (Princess Diana was descended from New York heiress Frances Work, and the mediatized House of Croÿ is lead by the grandson of an American heiress). Despite protestations to the contrary, Americans have always been fascinated by titles, whether royal or noble, and prior to the massive influx of American girls in the late Victorian era, there was a little wave of Anglo-American matches in the colonial and Federal eras (1780s-1830s). In 1798, a daughter of the governor of Pennsylvania married the Marquess de Casa Irujo, the Spanish minister to the United States, and John Jay, the first US Chief Justice, had two granddaughters who married successively, the 6th Viscount Exmouth. Three Caton granddaughters, descendants of a co-signer of the Declaration of Independence, married the 7th Duke of Leeds, the 8th Baron Stafford, and the 1st Marquess Wellesley, brother of the Iron Duke, respectively, and the first royal-American match was made between Betsey Patterson and Jerome Bonaparte, future King of Westphalia. 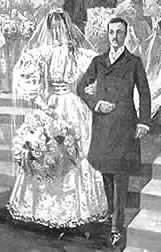 The spark that lit the flame of Anglo-European matches after a forty year hiatus was the 1874 marriage of Jennie Jerome of Brooklyn, New York and Lord Randolph Churchill, second son of the 7th Duke of Marlborough. 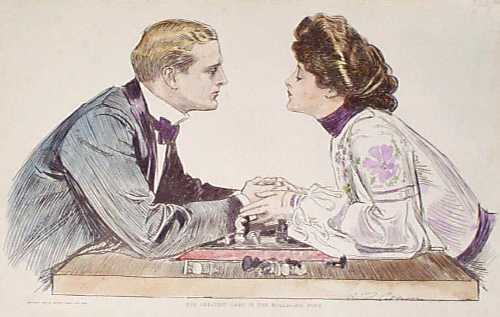 Jennie and Randolph never thought their impulsive love-match would trigger the ambitions of social-climbing American millionaires born of the post-Civil War, but the subsequent marriage of her friends Consuelo Yznaga to the dissipated Viscount Mandeville (future Duke of Manchester) in 1876, and Minnie Stevens to Colonel Arthur Paget in 1878 sealed the fate of the nouveau riche American heiress. In 1895, nine American heiresses married titled British men, including a duke, an earl and three barons. But soon there emerged a flaw in the plan: the system of primogeniture only gave the eldest son a title and put him in line to inherit a greater one. For Catholic American girls, and those who were too impatient to wait for a father-in-law to die, the hunt on the Continent yielded better results: one could become a Princess; that must certainly be higher than a Duchess! And so, the princely and noble titles of Austria-Hungary, France, Germany, Italy and Spain were also blessed by Providence with restored coffers and manor houses. Russia was not for the faint of heart. If one wished to brave the bracing weather and the even colder Romanov court, princely titles abounded (and some even related to the Romanovs–though if one aimed too high, as in the case of Harriet Blackford, who wished to marry Grand Duke Nicholas, the Imperial Family was apt to deal harshly with both parties). Though many European-American alliances ended dreadfully, a few American women proved their mettle by assisting their husband’s ambitions. 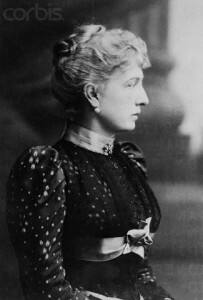 Mary Leiter, who married George Nathaniel Curzon in 1895, eventually became Vicereine of India–the highest social and political position in the British Empire behind the Queen. 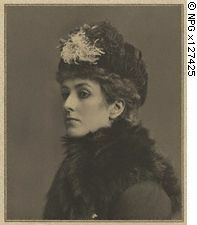 Despite being relegated to the shadows of history, Mary Endicott, wife of Joseph Chamberlain, was her husband’s partner and equal during his long and controversial political career. Another American heiress who held all the cards was Anita Rhinelander Stewart. In 1909 she met Prince Miguel de Braganza, whose father was referred to as the Pretender to the Portuguese throne, and three months later, they were engaged. At first it was announced that the marriage would be morganatic, but Anita refused to accept anything less than the title of princess. And she got it: Emperor Franz Josef of Austria-Hungary, who extended hospitality to the exiled Braganzas, created the tenacious American the Duchess Vizeu & Princess de Braganza in her own right. Before Grace Kelly, there was another American Princess of Monaco: Alice Heine of New Orleans and widow of the Duc de Richelieu. 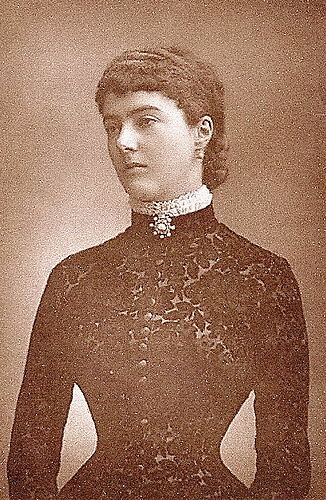 Alice married His Serene Highness, Prince Albert I of Monaco in 1889. To their marriage she brought a strong business acumen and worked hard to change the reputation of the principality from that of a gambling den to a place of culture. It was Alice who established the Opera house and installed a director who brought the world’s greatest operas to Monaco. Alice and Albert’s relationship cooled soon after their marriage, and she took a series a lovers, the most notorious being Isidore de Lara. Fed up with his wife, Albert made their break public when he slapped Alice in the face at the Opera when she stopped to whisper to her lover. She packed her bags in 1902 and left Monaco forever. 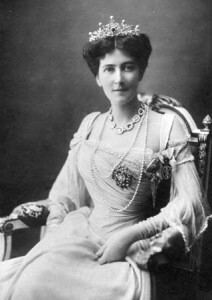 Besides Lady Randolph Churchill, the best-known American heiress is the Duchess of Marlborough, née Consuelo Vanderbilt. This derives partly from the delightful memoirs she published in the 1950s, and partly by the fact that she was one of the wealthiest heiresses of her time, with a dowry of approximately $2.5 million ($75 million in 2008 dollars), and wed, in 1895, one of England’s premiere dukes. In her memoirs, she recounts the vigorous training and tutoring enforced by her mother Alva, and the secret fiancee she was forced to release when her mother set her sights on Consuelo marrying a titled European. 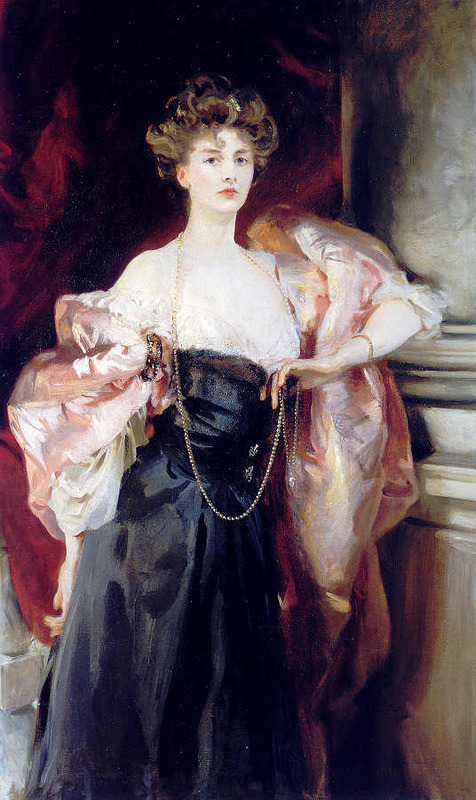 Though no one knew it then, Alva Vanderbilt feigned mortal illness to convince her daughter to accept the proposal of the 9th Duke of Marlborough, and the poor girl wept the entire way to her wedding. Their marriage was obviously unhappy, with the duke informing Consuelo he’d given up the woman he loved to marry her on their honeymoon, and by the birth of their second son (she coined the phrase “the heir and the spare”), their marriage was on the rocks. When they petitioned for divorce in 1906, the scandal rocked English society and King Edward made his disapproval known. From familial pressure, and the possible revelation of Consuelo’s aborted elopement with the also married Viscount Castlereagh, they settled for a legal separation. Both now banished from court circles, Consuelo turned her pain into helping the needy and raising her sons. They eventually divorced in 1921, whereupon Consuelo married Jacques Balsan, and Sunny, another American, Gladys Deacon. American women continued to marry European noblemen after the Great War, but the men were different, and so were the women. The devastation of the war created hundreds of nationless aristocrats, and also hundreds of fake aristocrats, who were eager to take part in the frantic pace of the 1920s and 1930s. There arose in the 1880s, the phenomena of the “professional beauty.” A curious phase had come over society wherein publicity became the fashion, and from it, the craze to exhibit photographs of “Ladies of Quality” in the windows of Fleet Street. Instrumental in creating this sensation was London-based artist Frank Miles, who specialized in watercolors of society women, and Lillie Langtry. 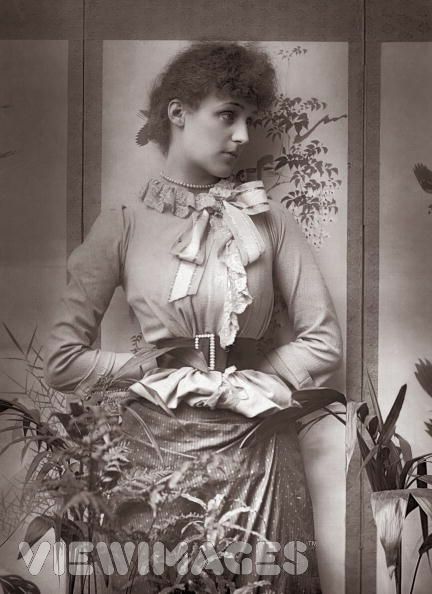 Born on the Isle of Jersey, she arrived in London in the mid-1870s with her alcoholic husband Edward Langtry and promptly entered society despite having little money. While her beauty at first created a mild interest, it was her attendance of social events clad in the same black dress that created a stir. When someone finally commented on her continuous use of that dress, she arrived at her next engagement wearing a white dress of similar fashion. This provocation created a furor and suddenly, artists wanted to paint her, hostesses vied to have her on their guest lists, and people (even the most fearsome dowagers!) even stood on benches in Hyde Park, or chairs at balls, to catch a glimpse of her. So great was her fame that her greatest wish–to be presented to Queen Victoria–was granted (some say at the instigation of the queen herself!). 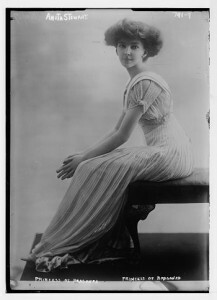 Coached by the highest in the land (the Prince of Wales, soon her lover), the wittiest (Oscar Wilde), and the most talented (James MacNeil Whistler), she cut a swath through aristocratic society. Frank Miles, one Lillie’s earliest acquaintances, capitalized on the increasing voraciousness of people for pictures of society beauties, and these women, subsequently dubbed “Professional Beauties” or, P.B.’s for short, took not only London at large by storm, but the known world. Just about any beautiful woman could become a professional beauty–not through success at court, but in the emerging celebrity culture associated with illustrated periodicals and mass-circulated photographs. The professional beauty needed not be rich, highly born, nor well educated–provided she had sense enough to escape from committing any glaring missteps–all that was required of her was that her face should be approved by society as a great beauty and her future was assured. Recognition as a P.B. was reward in itself. Reproductions of the beauties appeared in every store window and hung in every middle-class dwelling. The originals graced the mansions of wealthy patrons of the arts. Queen Victoria ‘s youngest son, Prince Leopold, became so enamored of a pen-and-ink sketch of Lillie Langtry he had seen while visiting Miles’s studio that he acquired it to hang in his bedchamber – until his mother snatched it down. In London, the professional beauty was queen. Not a ball was considered a success without her presence. At dinner she eclipsed rank wealth and fame and was the object of attentions which would be flattering were they less curious and obtrusive. Should she ride in the Row a little cavalcade accompanied her, which only quit her presence when some very distinguished personage came up to canter by her side. At a country house party, no matter who may be the visiting, she was always the most favored of guests. So firmly did the professional beauty rule society that her word was law and her wishes commanded the amusement of the hour: If she voted guessing acrostics dull, acrostics were abandoned. If she was fond of hunting, the best and safest of mounts that the stables possessed were placed at her disposal, whilst the most sober and careful of grooms was to specially attend upon her and to see that her exquisite beauty should not for a moment be in danger. Was blushing in her hair. 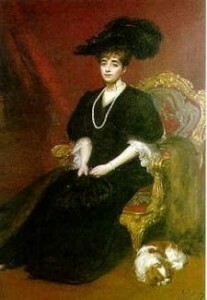 Other preeminent professional beauties were Lady Lonsdale (afterwards Lady de Grey), Lady Brooke (later Lady Warwick), the Duchess of Leinster and her sister Lady Helen Vincent, Lady Londonderry, Lady Dalhousie, Lady Ormonde, Lady Mary Mill, Lady Gerard, Mrs. Luke Wheeler, who always “appeared in black,” and Mrs. Cornwallis West, the mother of Lady Randolph Churchill’s much younger second husband. Accordingly, and some say, obviously, many of these women reigned briefly as the Prince of Wales’s mistress. In direct contrast to these London beauties, the professional beauties of Paris were not ranked or cataloged. They did not have their portraits published in the illustrated papers nor did they allow their photographs to be sold at the stationers. However there always existed a little staff of about twenty women who represented grace, beauty and Parisian elegance. 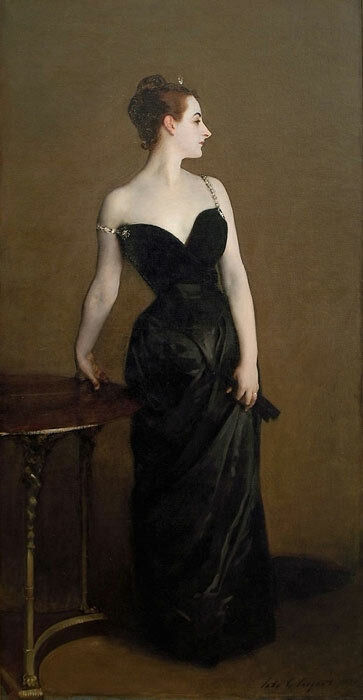 But one Parisian hostess did break the mold: Virginie Amélie Gautreau, who is better known to history as the subject of John Singer Sargent’s “Portrait of Madame X.” An American expatriate married to a wealthy French banker, when her painting was revealed in the Paris Salon of 1884, it caused a scandal. Already trailed by whispers of fast behavior, the portrait as painted, was of a sexually-aggressive woman clad in a figure-hugging black gown whose right strap had fallen–a hint that with “one more struggle“, wrote a critic in Le Figaro, “...the lady will be free“. 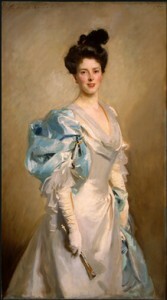 Amidst the outrage and ruination of his career, Sargent painted over the strap to secure it on Madame Gautreau’s shoulder and concealed the painting for over thirty years. As for the lady, her reputation was destroyed and she passed the remaining years of her life alternately attempting to recapture her fame and escaping the realities of time by avoiding mirrors. The professional beauty’s American counterpart was found in the “Gibson Girl” of the 1890s and 1900s, as created by Charles Dana Gibson. 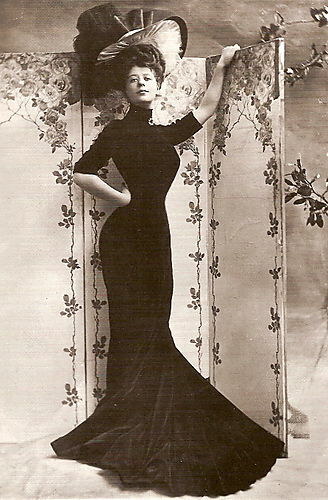 The Gibson Girl set the first national standard for a feminine beauty ideal: “She was taller than the other women currently seen in the pages of magazines.. infinitely more spirited and independent, yet altogether feminine. She appeared in a stiff shirtwaist, her soft hair piled into a chignon, topped by a big plumed hat. Her flowing skirt was hiked up in back with just a hint of a bustle. She was poised and patrician. Though always well bred, there often lurked a flash of mischief in her eyes.” The Gibson Girl appeared on saucers, ashtrays, tablecloths, pillow covers, chair covers, souvenir spoons, screens, fans, umbrella stands and was personified by Gibson’s wife, Irene Langhorne, Evelyn Nesbit and the Danish-American stage actress, Camille Clifford, whose towering coiffure and long, elegant gowns wrapped around her hourglass figure and tightly corseted wasp waist defined the style. Depicted as an equal and sometimes teasing companion to men, the Gibson Girl was provocative and independent, perfectly expressing the cool exuberance of the turn-of-the-century American lady. The life of a professional beauty could be wonderful, exhilarating and fun, but only on the condition that she remained beautiful and charming, had not a hairsbreadth of scandal attached to her name, and could financially maintain her socializing. This was near impossible not only because of her attachment to the spendthrift and frivolous Marlborough House Set, but also the passing of time. 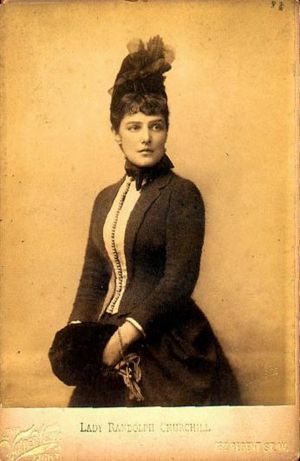 Lillie Langtry fell from grace when she bore a child out of wedlock, and only recaptured a bit of her fascination by becoming a moderately talented actress. 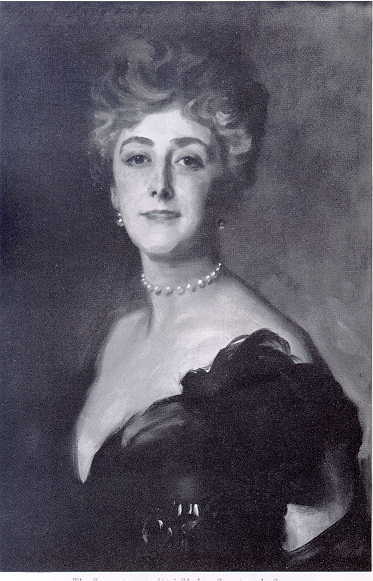 Even aristocratic women found it difficult to escape the fate of chance: Lady Randolph Churchill was plagued with money troubles all of her life and Daisy Warwick, her family fortune run dry by the 1910s, attempted to blackmail George V into granting her renumeration for her amusement of his deceased father by threatening to publish the letters he exchanged with her during their relationship. Truly only a step above a courtesan, the professional beauty was protected from scandal and the taint of sexual immorality by her rank and marriage. But in a time where women could be considered property (though this lessened considerably by the 1880s in comparison to earlier eras), and her social roles were defined and the boundaries between “public” and “private” were beginning to blur, the P.B. could essentially have the best of both worlds: the fame and fascination of an actress and the venerated social status of an aristocrat. London Society by eds Hogg, James and Marryat, Florence.